Spring has officially sprung! And yet the snow will not seem to let up and melt away. During these last, long few months of winter, I’ve started to think ahead to sunny, summer days. What better place to be than transported back to the Depot Theatre in 1987 and William Shakespeare’s A Midsummer Night’s Dream. 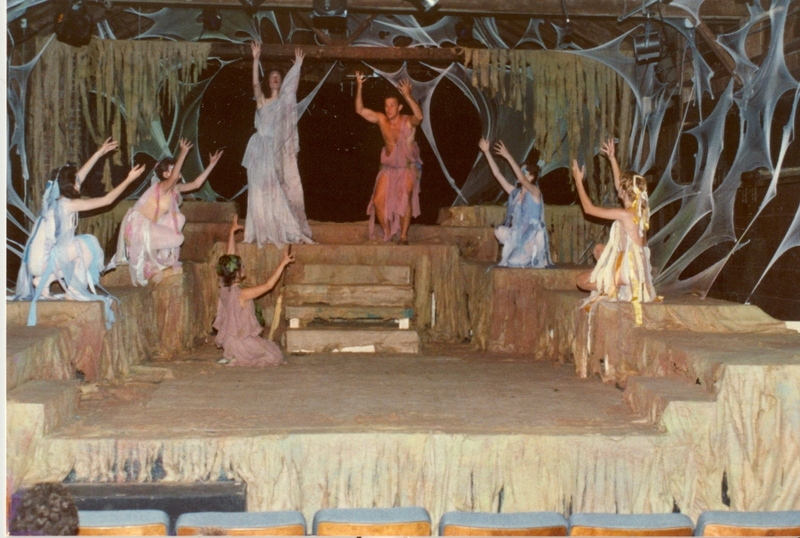 The play takes place in an enchanted wood outside of Athens—a welcome change from chilly upstate New York! 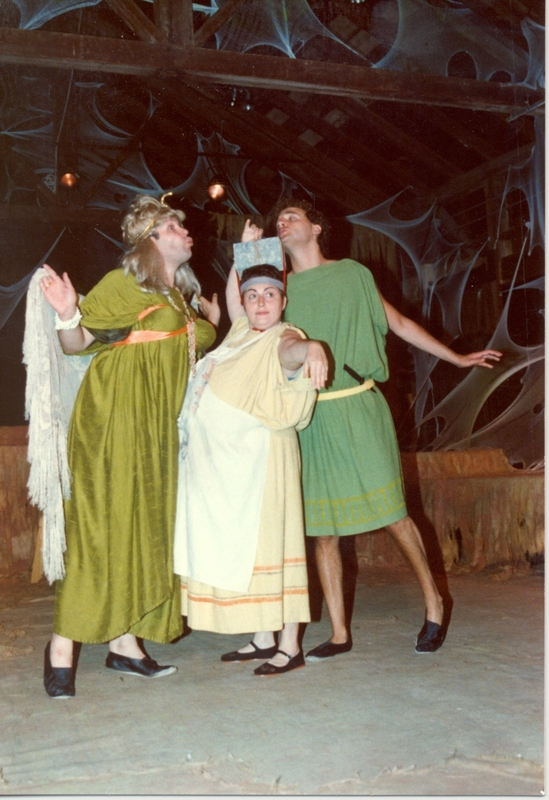 Look through some photos and peruse the playbill from the Depot’s take on this Shakespearean staple. Click on any image in the gallery below to enlarge and begin a slideshow. 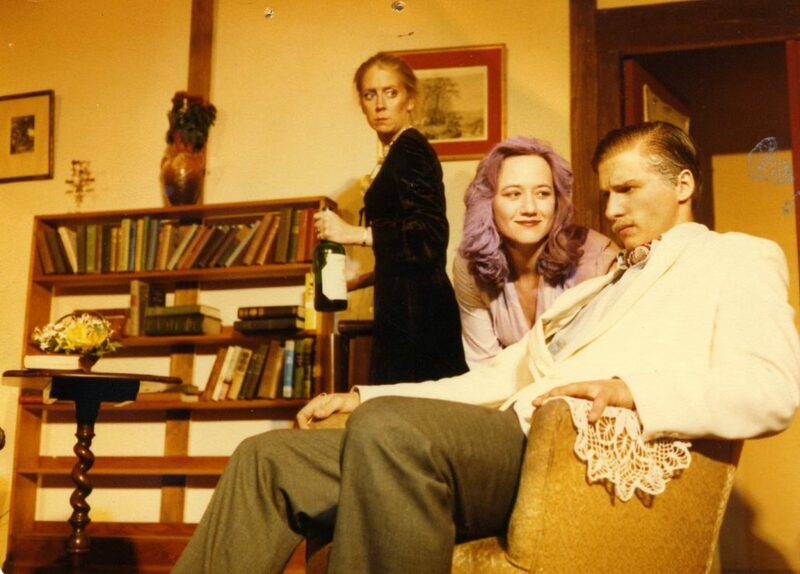 Follow the Depot Theatre on Social Media! Lindsey Poremba is a senior at Skidmore College. She is from Brookline, New Hampshire, but in the past few years has grown to love living in upstate New York. 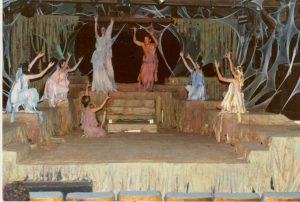 At Skidmore, she is studying art history and arts administration, which led her to learn about the Depot Theatre, and the Westport community. This semester, she is continuing the work of archiving visual materials for the Depot Theatre. Note: The Depot does its best to identify photos and other materials in our archives. Given the 40-year span, there may be missing or incomplete information. 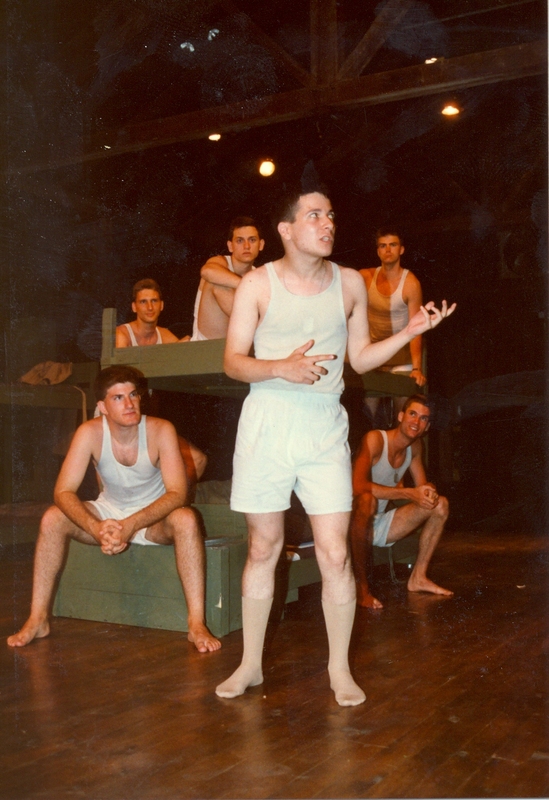 We welcome any additional information, corrections and edits that will help complete the archive for years to come! 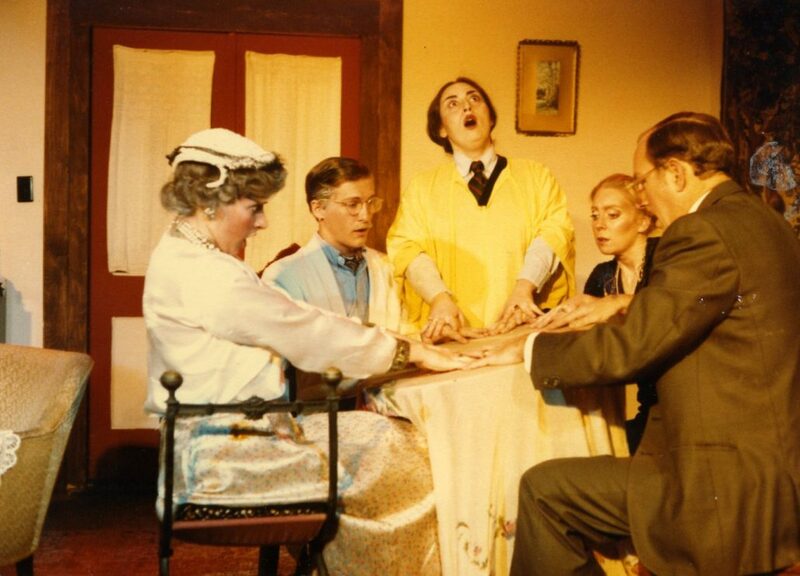 As the Depot Theatre approaches its fortieth anniversary season, I wanted to take a look at what other landmark anniversaries the Depot has celebrated. 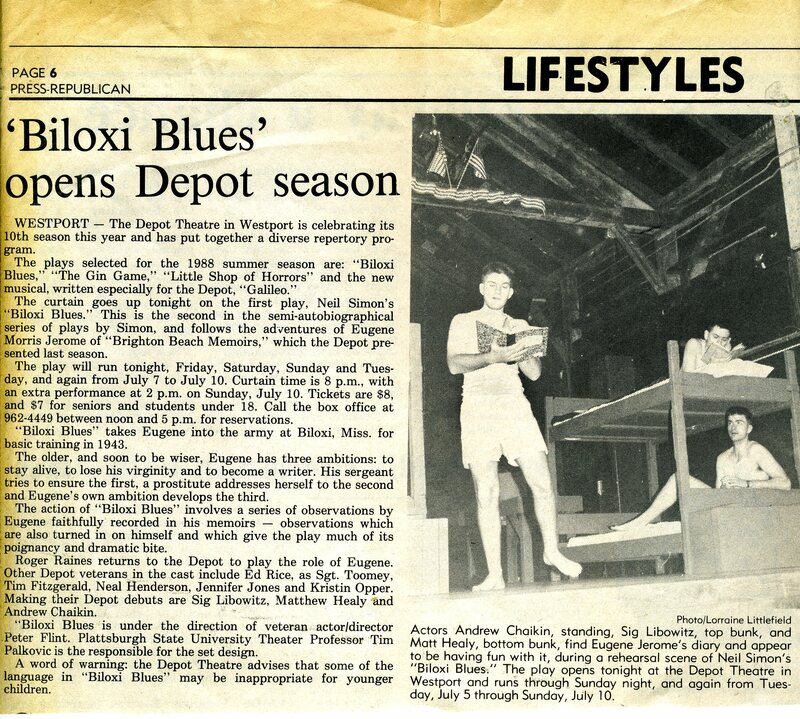 In 1988, the Depot Theatre kicked off its tenth season with a great repertory — Biloxi Blues, The Gin Game, Little Shop of Horrors, and Galileo. 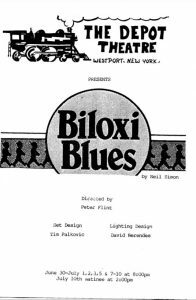 Biloxi Blues, the season opener, is the second installment in a series of semi-autobiographical plays by Neil Simon. The Depot Theatre put on the first play of Simon’s series, Brighton Beach Memoirs, the previous summer in 1987. 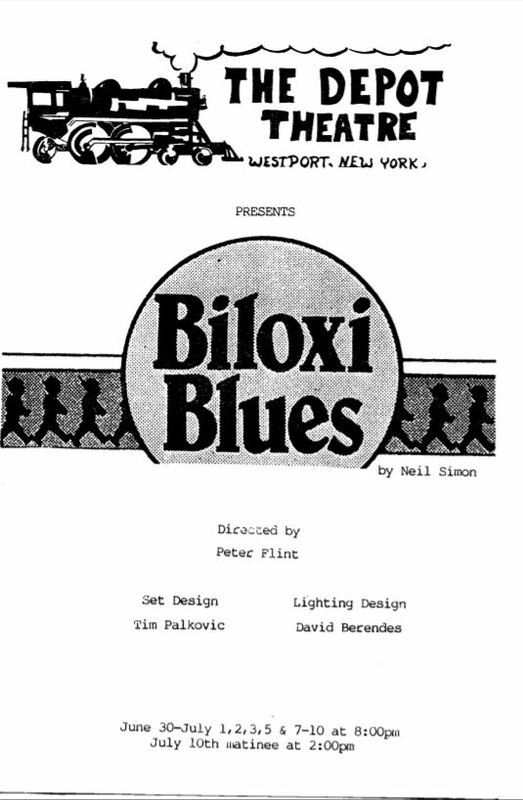 Look through the playbill of Biloxi Blues below to see if any familiar names stand out to you! 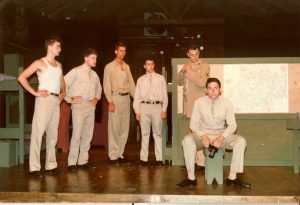 The cast includes Sig Libowitz as Arnold Epstein, Roger Raines as Eugene Morris Jerome, and Ed Rice as Sergeant Merwin J. Toomey. Lindsey Poremba is a senior at Skidmore College. She is from Brookline, New Hampshire, but in the past few years has grown to love living in upstate New York. 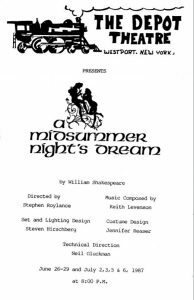 At Skidmore, she is studying art history and arts administration, which led her to learn about the Depot Theatre and the Westport community. 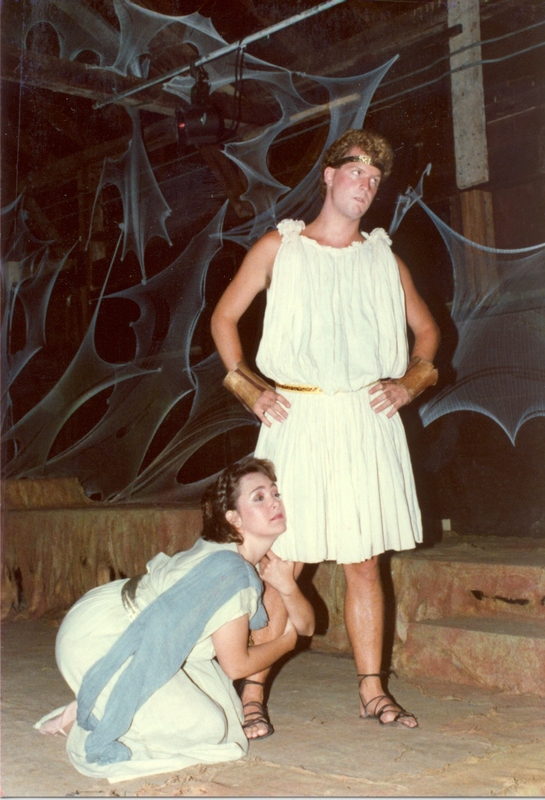 This semester, she is continuing the work of archiving visual materials for the Depot Theatre. 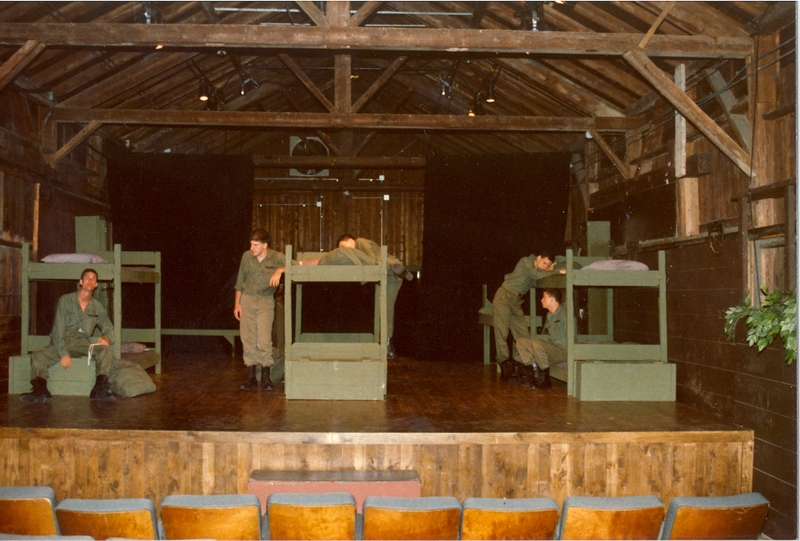 In the Depot Theatre’s 1980 season, they put on TEN shows, including Blythe Spirit. 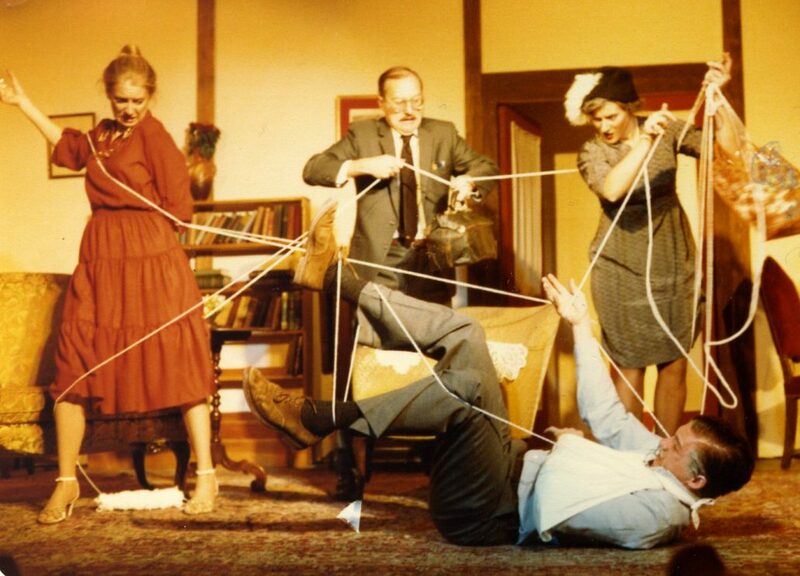 This comedic play by Noel Coward includes seances, socialites, and the ghost of a first wife. The energy and antics of these photographs caught my eye as I looked through the earliest records of Depot productions. 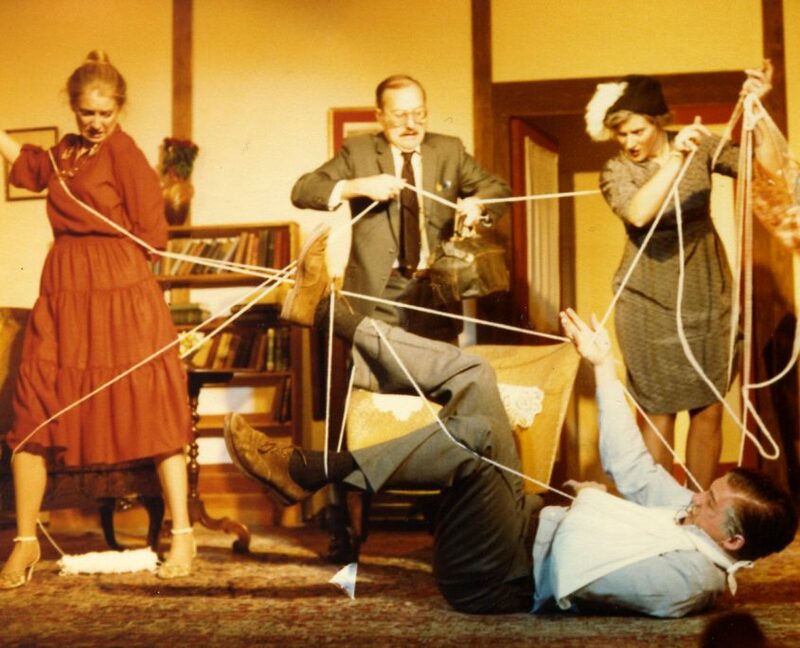 The actors tangled up in a web, and their facial expressions during the seance made me smile. These photographs capture the humor of the story in just a few shots. 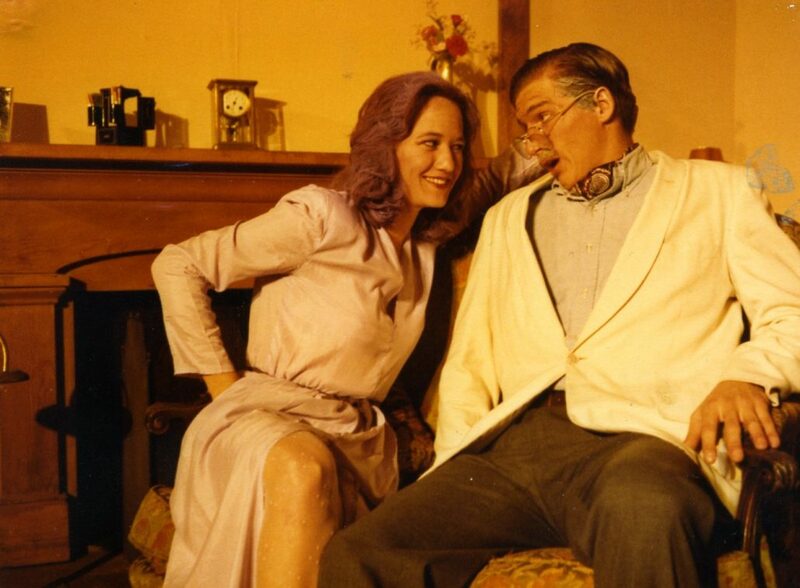 Plus, the white blazer on the character of Charles Condomine, socialite and novelist, appears to foreshadow the larger shoulder pads to come in the decade. Enjoy this photo gallery from that production! 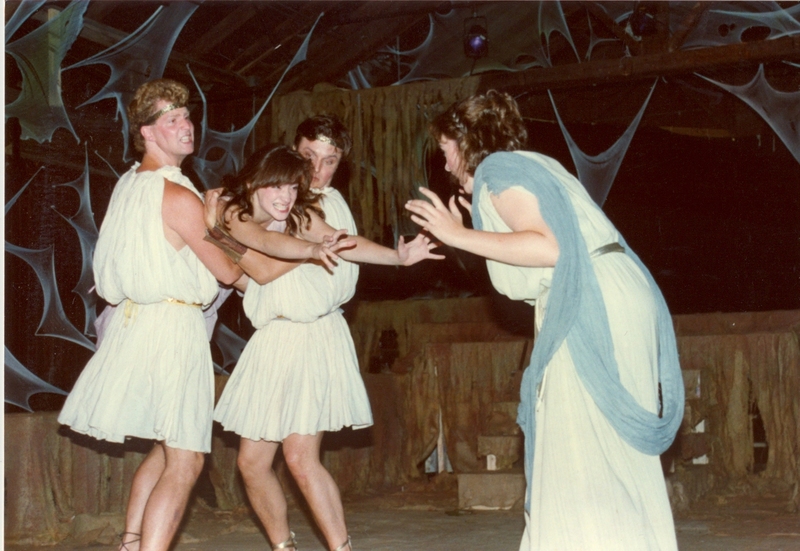 Check out the rest of the Depot Theatre’s history at THIS LINK! -Lindsey Poremba is a senior at Skidmore College. She is from Brookline, New Hampshire, but in the past few years has grown to love living in upstate New York. 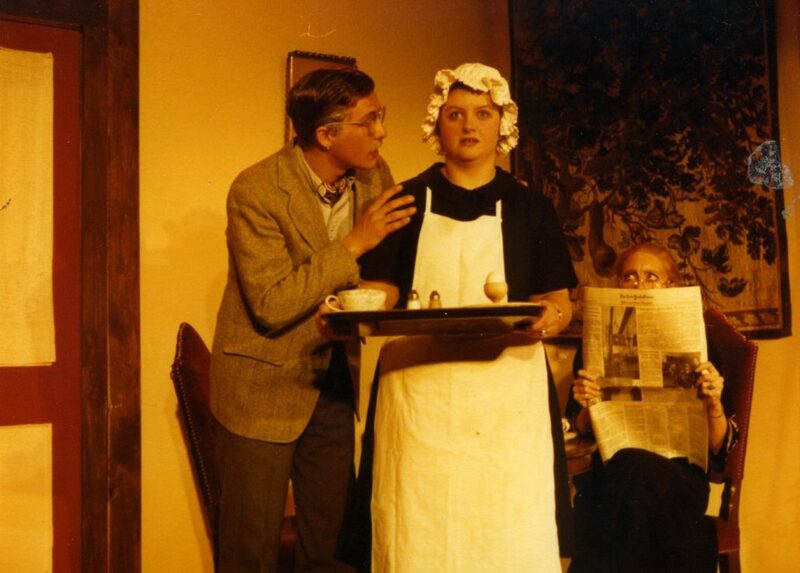 At Skidmore, she is studying art history and arts administration, which led her to learn about the Depot Theatre, and the Westport community. 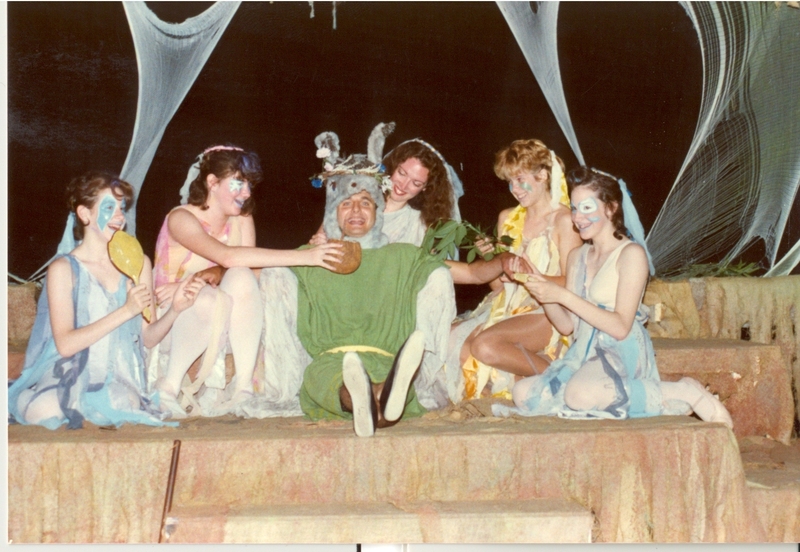 This semester, she is continuing the work of archiving visual materials for the Depot Theatre. 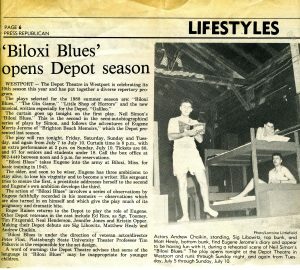 The Depot does its best to identify photos and other materials in our archives. Given the 40-year span, there may be missing or incomplete information. 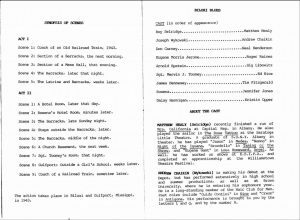 We welcome any additional information, corrections and edits that will help complete the archive for years to come! 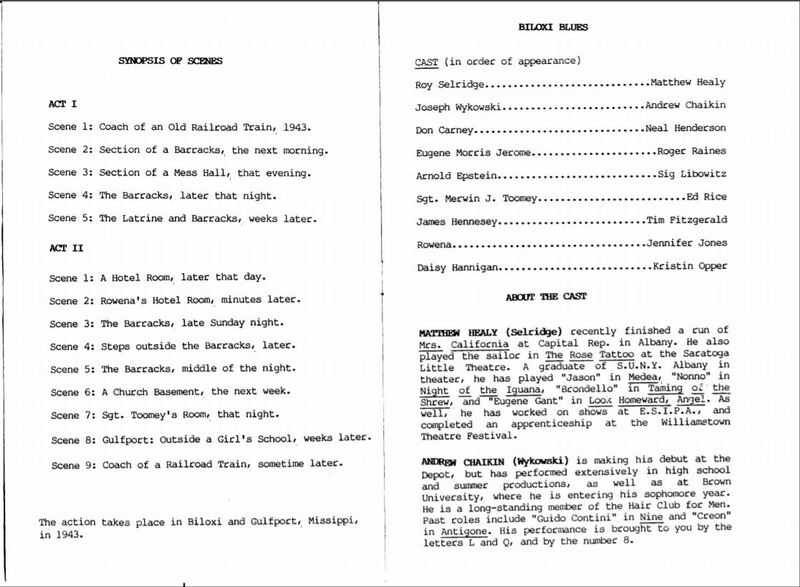 Just a sampling of Depot Theatre materials archived by Skidmore students. 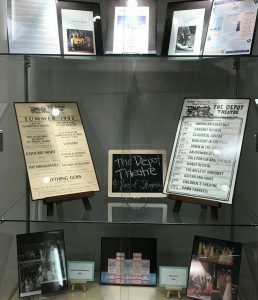 As the Depot Theatre nears its fortieth anniversary season, I have had the privilege of looking through its past—in the form of photographs, playbills, press releases, and much more. 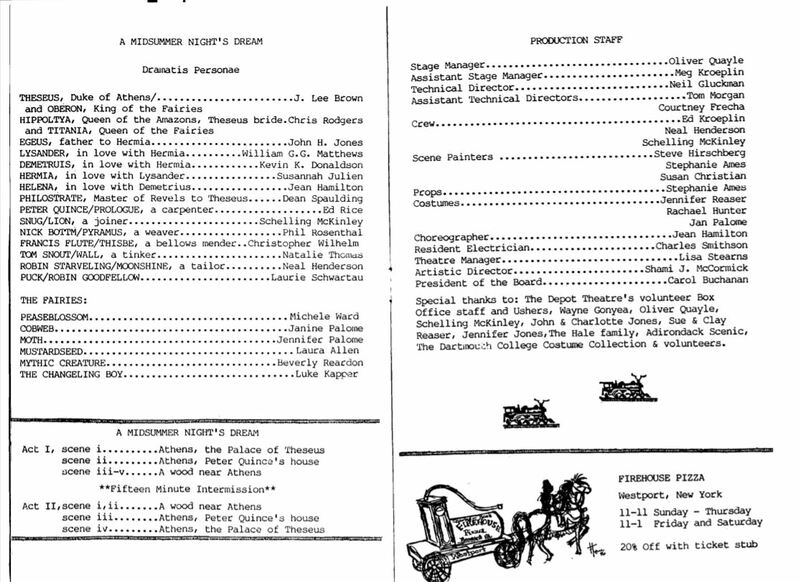 The Depot Theatre and Skidmore College began the project of archiving past materials in the spring of 2017, with the MDOCS (John B. Moore Documentary Studies Collaborative) class “Archival Storytelling,” taught by Jordana Dym. 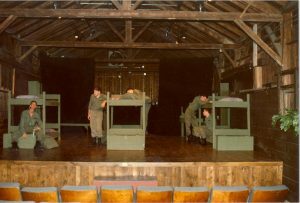 The class recovered extensive archives from the Depot Theatre, and began the process of cataloguing and interpreting the story of the organization. Senior Geoffrey Greene continued the project over the summer of 2017. He has played a fundamental role in scanning and digitizing the collection, which beings in 1978, forty years ago. I am excited to continue this project in 2018, and share the archives online. As the Depot Theatre celebrates forty years of history, be on the lookout for releases of archival material, both through the website as well as social media!